Okay it’s already Monday Morning and 4:30 am to be exact. I’m awake with my life, health and strength – gotta thank God for that. The sun has not risen yet and neither has my child. In the dark creativity sparks: unbridled and quite wild. that I can win poetry slams with – post a few poetic rehearses. Morning Joe is on MSNBC and Mika is looking her usual classy-sharp. Bless Joe’s heart, he’s usually smart, though of late, has been a bit of a tart. Mitt Romney makes him do it; Joe is forced to throw up his political hands. Mitt’s wit is no made up myth and is killing his Presidential stance. Last week was the first Presidential debate and Romney played the flip flopping aggressor. Obama showed up but not nearly as rough and played the role of the irritated professor. This week there’s another debate & it should be packed with a consensus of common sense. It’s Paul Ryan versus Joe Biden – in the intense battle for: Vice President. Also this week, I’m slated to restart my exercising plan. I think it’s time I (finally) exit the “40 & leisure” band. Living in Arizona ain’t easy – We’re finally rid of the triple digits. This A-Z heat is satan’s treat, and is due a West Coast pivot. It’s starting to feel like Cali around here – and how happy am I? I’m spending this morning with my kid, because school is on a bye. Enjoying my beginning of the week, because you and I are together. “Okay it’s already Monday Morning and 4:30 am to be exact. LOL! You are so funny. Rawr! 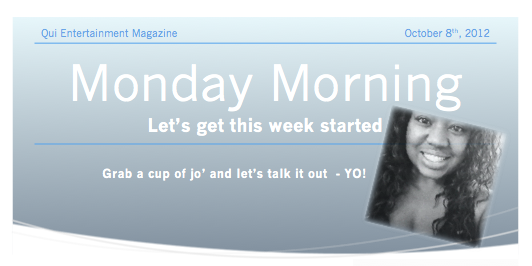 Yes, I was wide awake at that hour and my “flash of inspiration” was to hammer out my blog perspective and sip a cup of jo. What “flash of inspiration did you have” (beyond the cuddle)? Do we (YOU) have another literary project coming up?